There are many possible causes of pain over the front or “deep in” the front of the knee or knee cap. These include damage to muscles, tendons, ligaments, cartilage, may be related to “wear & tear” (later BLOG on this ! ), alignment or even from the hip (referred pain – Later BLOG on this to). NONE OF THE EXERCISES SHOULD CAUSE PAIN- during or after them: They should strengthen and make your knees feel good. “Guinea Pig Exercise”: Intrigued ? see 2 photos below ….. Imagine the towel is living guinea pig (gp) you are trying to hold the gp with your knees so it cannot run away DO NOT Squash it! This pressure is maintained THROUGHOUT the exercise which should take about 30 seconds. NOW, this is the clever bit ! 1st press your knees together against towel guinea pig (keep this pressure) NOW press your ankles against each other (1 forward, the other backwards) for 5 seconds and release briefly and repeat 5 times BUT DO NOT let the pressure at the gp change …….. NO MORE & NO LESS pressure – it takes CO-ORDINATION & MUST NOT HURT AT ALL, maximum pressure but no PAIN! Called this as the first part (A) is repeated 1st and last and the middle part (B) is like a filling in the middle … does that make sense? Part (A) – (the bread): A firm pad is placed under the back of the knee. The 1 in the circle means do this first – press your thigh down against the pad firmly but painlessly and maintain this throughout part (A). 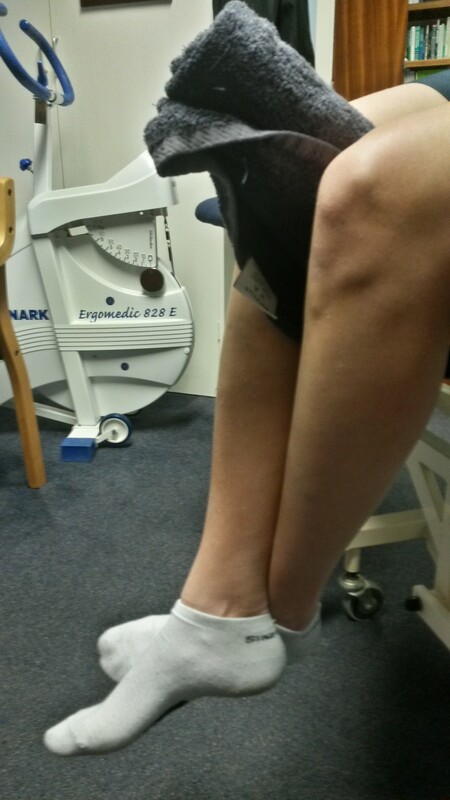 Next straighten lower leg shown by the dotted line and by the 2 in a circle. There will be stretch down the back of your leg and the front thigh muscle (the quads) should feel firm. No pain. Single Leg Balance: Just Play video. This shows someone standing and balancing for a few seconds on a pillow with their eyes open. You could try at first WITHOUT pillow & even start with holding onto something stable, much later on try with your eyes closed and gradually increase to 1 Min. Start where you feel confident & gradually make harder. Whiplash: what is it & what should you do? My aim with this blog is to present some information which is useful whether you are medically trained or not; so breeze through the jargon that means nothing to you do NOT get bogged down with terms. The term whiplash has been hijacked by the claim culture “system” the same thing happened to “RSI – repetitive strain injury” ; sooner or later it seemed to get outlawed and the claims have largely disappeared. The same could happen to whiplash …. because of a few making good (bad!!) money out of claims. This affects the majority of genuine injuries seeking help. Whiplash is an injury usually to the neck area but can affect any part of the back or even shoulders. It is due to a forceful, rapid back-and-forth movement of the body, the nature of the injuries depend also on the direction of impact, whether the car was spun or rolled. Whiplash most often occurs during a road traffic accident, however the injury can also result from a sports accident, physical abuse or other trauma. 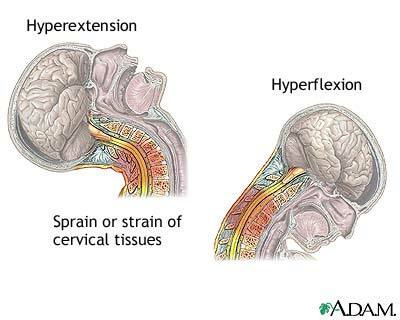 Common signs and symptoms of whiplash include neck pain, neck stiffness and headaches. Pain may be referred to other areas and tenderness felt widely as well. For most people the whiplash symptoms will recover within a few months after a course of pain medication, exercise and other treatments. Some people, however will continue to experience chronic neck pain and other ongoing complications including psychological & emotional effects along with aches and pains that are difficult to adequately explain. Whilst the stats are VERY MUCH in favour of a happy recovery. It is still a miserable time. For a more technical summary of Whiplash see the attached document (below in red) by the IASP (THE international ” go to” pain people ). Grade 1: neck complaints of pain, stiffness or tenderness only but no physical signs are noted by the examining physician. Grade 3: neck complaints plus neurological signs such as decreased deep tendon reflexes, weakness and sensory deficits. There appears to be some common risk factors of developing a difficult to shift whiplash pain, they are similar risk factors for any pain being difficult to shift. 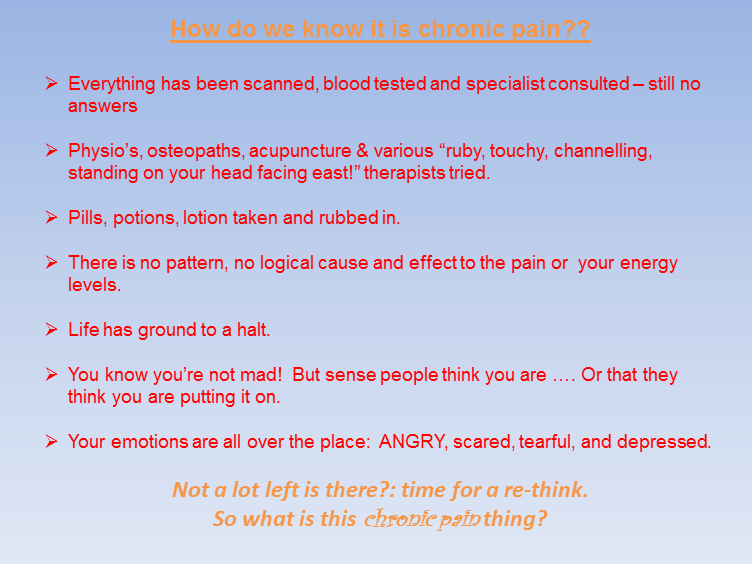 This type of pain is called CHRONIC PAIN. later BLOGS on this …. Risk Factors: for chronic symptoms like pain & stiffness. The table below shows the factors which do and appear not to relate to the chances of developing an outcome or prognosis of chronic pain: The box on the left shows the ones most likely or possible to lead to chronic symptoms; possible only! Managing Whiplash early on: (1st 12 weeks): Have you been checked out ?? Maybe at the scene, by your GP, at A/E or by your therapist; do you need to ? SELF ASSESS ..
Amazingly most people suffer only soft tissue injuries to the neck, low back or shoulders. Major nerve or bone damage seems uncommon. Although the injuries are more like a sprain or strain type injury they often strangely take longer than would be expected and with an tendency to vary between good periods and bad quite randomly. The thing to take from this is slight quirkiness is that it is normal (not easily explainable but quite normal). In this 1st 12 weeks you need to do the basics WELL. I know this seems too simple. first week or two look after your posture, use pain relief which should include heat or ice (whichever works for you), simple rubs and creams, move you neck or injured part through an gradually increasing range of movement, try to get on with work or chores. Your work may need to be involved some employers won’t want you there unless you are 100% or unless cleared medically to be there. The link above (in RED)is quite useful for some simple exercises early on. There are three videos. They will talk about holding some positions for 20 seconds but this should built towards and I would suggest 3-5 second holds. They should not be painful – “pleasant stretchy pain” that get easier as the days go by. Done twice a day ideally. For the most part the healing process in the majority of whiplash injuries which as we have already said are soft tissue based (ligament, muscle and tendon based) are now HEALED. They might need toughing up a bit more, stretching, loosening “unspasming” but this is the prettying up or “painting and decorating” stage of healing. BUT YOU STILL HURT ! pain without purpose – pointless BUT certainly agony, miserable, terrifying AND REAL. YES there may also be psychological factors, sociological, financial, personal life changing factors that could be part of your whole experience of the pain you still feel. Mind & Body – always together not one or the other …. ARE there some mis-diagnosed, mis -managed, misunderstood whiplash problems YES there are …..but they are very, very few, MORE usually they are impossibly complicated. BUT this BLOG is about the majority HEALED but STILL HURTING. You are on staircase to a better life EVEN with your pain – REALLY ! well yes probably: plan for the worst. YOU have to get on with life – to live – You can & YOU will…. PACE – make your activity achievable, small victories are best. PLAN – review the success of your 1st step – plan the next step: slightly more slightly less or repeat the same. There will be some UP’s and some DOWN’s – you will not get it right all the time. Increases in PAIN are to be expected and will most often be FOR NO REASON – so don’t over analysis. Do not get controlled by the good day / bad day swing door – do Too much on the Good days and do nothing on the bad !! Sometimes called the under activity / over activity trap. Do what you planned, Stick to the plan NOT more Not less. Build in rest – this might be a lie down but could easily be a lighter activity. But PLAN it – DO IT. There is light at the end of the tunnel. The body can recover, the nervous system can “re-wire” (more about this idea in later BLOGS on chronic pain) so it is not impossible for the symptoms of whiplash to go away. I have had many people tell me 1-2 year after the injury they have returned to normal. However, and I know it seems a great big fat lie but you can live and live well even with pain. I hope this BlOG gives you some pointers, some hope. 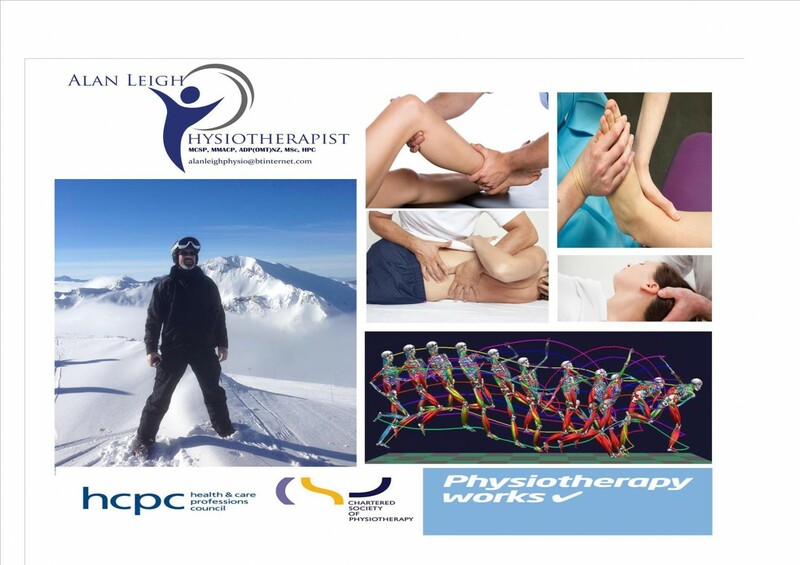 You shouldn’t have to do it alone there are some inspirational PAIN SPECIALIST PHYSIO’s . Whether I am a specialist or not I don’t know but I spend a lot of my day to practice working with people like you. Pain is supposed to be useful. It warns us of injury, illness – to avoid putting our foot back on the floor when we have stepped on a tack…..BUT sometimes even this useful system goes wrong – that is what this blog is looking at. Lets start with a definition: As defined by the leading world authority on the subject – The International Association for the Study of Pain (IASP). There is lots of detail to understand in that definition. Note the use of the word emotional – pain is miserable, depressing, agonising and so much more than this. The sensory bit is things like dull, sharp, stabbing, aching. Also note the use of words ACTUAL – meaning you are damaged and the word POTENTIAL – there isn’t any damage but the threat is sufficient to produce a response ! The image above is trying to show that acute pain (new pain or damage pain – “useful pain !! there’s a thought for you) is relatively simple: damage produces a simple “ON & OFF” switch of pain that is proportional or correct for the level of damage. Switches off when the problem is sorted. 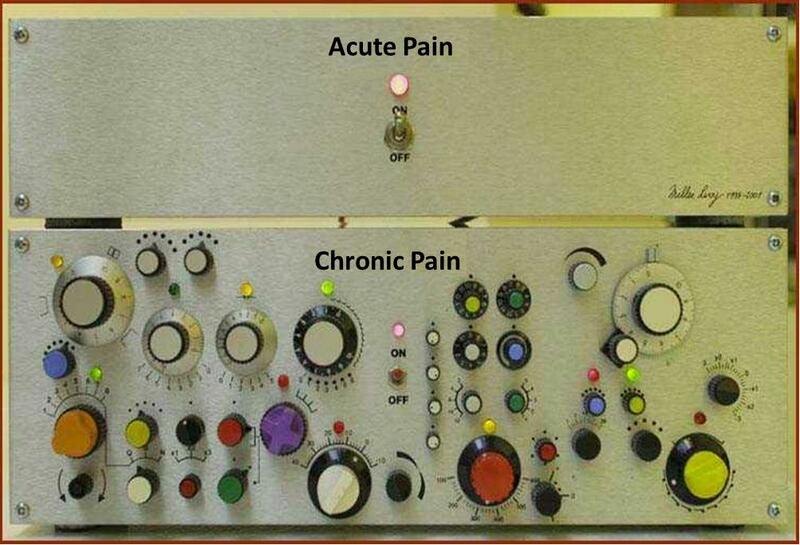 The Chronic Pain device is filled with complicated dials and no obvious “OFF” switch. Chronic pain can be due to a long term medical problem and therefore appropriate (many of the “arthritis” conditions are examples, there are about 200 different types of arthritis !!) BUT more often chronic pain is FAULTY, pointless, useless, greater than the level of any remaining damage, existing when NO damage exists anymore, going up & down for no obvious reason. YES: It is still miserable, agonising, depressing, and affects your life & REAL. NO; it is not imagined or made up….. BUT…. YOU ARE NOT DAMAGED OR BEING DAMAGED DESPITE WHAT IT FEELS LIKE !! Of course you need to be sure that there is no cause, disease or that something has been overlooked. Then what? …..
…..well, this is whole new world, a change of what you believe, your body seems to telling to you there is something wrong BUT there isn’t. The “spark” that seems to ignite your pain is often small, “a draft”, “I sat wrong” or so many other triggers which get blamed for causing a flare up. Stress is a significant factor in amplifying, influencing pain. Stress chemicals are evil and do affect how we experience pain and cope with pain. But if you want to move on and” get your life back” changing your thinking is what you must do. And yes it is absolutely possible millions of people do … they get to enjoy life, living “despite pain” !! …. So on with the concept of how do you get started. So go on get out an old fashion note pad. Set a couple goals – to leave the house, to do something in the garden, to meet up with a couple of friends, do a walk. The use of Metaphors in medicine: confusing or an enlightening use of language? life is like a box of chocolates, you never know what you’re gonna get….. Diagnosis is more like an umbrella term….. Sometimes the metaphor is an exaggeration (a hyperbole) and sometimes used to make a point and be precise (an antithesis). An ANALOGY is usually where the comparison is more literal or similar. A SIMILE – usually different things are compared. The (hopefully) useful thing about metaphors is they can help put complicated medical jargon or descriptions into “layman speak” or ways that seem familiar. So this may be in work terms such as comparing nerves to electrical cable for electricians, or the complexities of the healing process to say road repairs or building an house extension – I’ll use these later in this BLOG mainly in areas of pain and healing. Medical researchers seem mixed in their agreement about whether metaphors are good or indeed just a different sort of bad and not enlightening at all!! but here goes…………….. There are several variations on the use of an alarm system as an analogy for persistent pain. The idea is that the original trigger for the pain has ceased, but the pain signals (alarm) continue to be transmitted. Persistent pain is like a doorbell that goes haywire. Usually when you press a doorbell it rings one house one time and that’s all. But, in the case of chronic pain, it’s as if the doorbell on one house actually rings every house on the block. And the doorbell doesn’t just ring once, it rings all day and all night (Tupper, 2012). Chronic pain is like a broken alarm clock. Imagine that your morning alarm clock goes off at 7 am, and you roll over to hit the snooze button, but it doesn’t turn off like it’s supposed to do. You try banging the snooze bar, switching the alarm off, unplugging the clock, taking out the batteries, and even throwing it out the window, but it still keeps ringing. You’re clearly awake at this point, so the ringing alarm clock is not doing any good anymore, but it just won’t turn off. The pain alarm in our body can be just like this broken alarm clock. It can just keep ringing and ringing even though it’s not helping us in any way (R. Coakley). Chronic pain is like a car alarm. Sometimes a car alarm can go off even when there is no sign of danger. For example, sometimes a large truck passing by can accidentally set off a car alarm in a parked car. Or, sometimes a car just needs to be gently bumped in order to activate the car alarm. Some car alarms, it seems, are very sensitive, while others hardly go off at all. The purpose of the car alarm is to alert other people that the car is in danger. However, when the alarm goes off accidentally and there is no sign of danger, it’s really just a false alarm. Cars with sensitive alarms send out more false alarms and people with more sensitive nervous system can have more false alarms (pain sensations) as well (C.T. Chambers, personal communication, 2013). Let’s look at metaphors for how impulses like pain, touch, temperature & many others travel up and down form the body part to the brain and back (Yep they go both ways!). There are many filters in the system that can be thought of as “like” gates….. 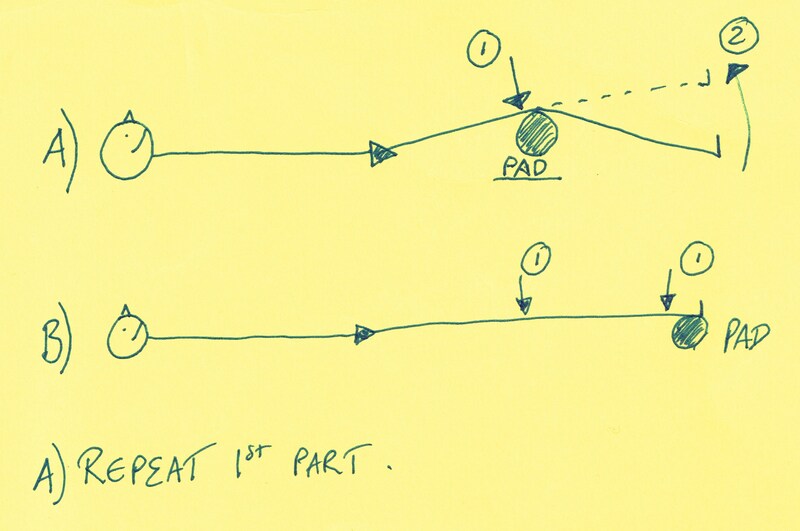 The gate control theory is a very popular theory, originated in the early 1960’s by Melzack and Wall. Whilst now it is known that this not absolutely the way it is, it is still a valuable concept. This theory posits that there is a virtual gate that controls the magnitude of the pain signal that reaches the brain (Melzack & Wall, 1965). It can be helpful to describe the path to people as an actual gate. You can think about pain signals being like trains passing through a railway crossing gate. When the gate is all the way open, trains pass right through. Similarly, when the gate to your brain is open, pain signals have free access to your brain. Medication might close the gate partway, but for many people, medications may not close the gate completely. The key idea here is that treatment whether it be physical therapy, manipulative therapy, acupuncture or talking therapies like CBT or mindfullness can help “shut the gate”. Here I discuss that there are stages, you don’t put up a roof without walls ! a good foundation is essential. In healing there are 3 stages: acute phase – lots of mess but hopefully a good foundation, then the sub-acute phase – the building of the structure and finally the remodelling phase – the painting, decorating making it useful. Now with every building project not everything may go smoothly or may need bits re-doing, maybe the plumber doesn’t turn as expected……hopefully you can see the analogy unfolding into something familiar. Similar to above but I use it for a slightly different emphasis: the analogy is used to explain “reflex muscle protection” or spasm in the analogy the miles of bollards used to protect the work force may seem excessive – they aren’t – but are a “pain” to all drivers! I tend to ask my clients what they understand from the analogy and see if it does indeed prove helpful..! The debate goes on in the literature are metaphors good or bad. The right ones work in the right hands for the right people !! Get them right and they are so EMPOWERING and HEALING in their own right. Facilitate the mind to allow the body to heal – It is a two way street!!! As ever like the bits you like, maybe see how they might work in your situation. Ignore if you wish… Enjoy.